Patterson finalized a two-year, $10 million contract with the Bears, Ben Volin of The Boston Globe reports. Analysis: It's really a one-year commitment, devoid of any guarantees beyond 2019. 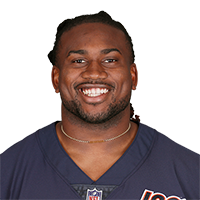 The Bears likely will deploy Patterson as their No. 4 wide receiver and kickoff return specialist in his age-28 season, with the potential to get him some carries on jet sweeps or even out of the backfield. He displayed impressive versatility with New England in 2018, spending a few weeks in the backfield when the team was hit by injuries. Patterson intends to sign a contract with the Bears, Adam Schefter of ESPN reports. Analysis: Patterson is planning on joining the Bears after one season in New England. He was used more as a runner than a receiver in 2018, carrying the ball 42 times for 228 yards while catching 21 passes for 247 yards. He'll likely handle kick return duties for Chicago and serve as a gadget player on offense. Patterson was on the field for four of a possible 72 snaps on offense in Sunday's 13-3 win over the Rams in Super Bowl LIII. Patterson (knee) practiced fully Wednesday. Analysis: Following the Patriots' first-round playoff bye, Patterson -- who was inactive in the Week 17 win over the Jets -- is slated to play in Sunday's divisional-round game against the Chargers. Patterson's versatility and play-making ability have made him an asset this season and as such, he could carve out some deep-league utility in postseason fantasy pools, even if his touches aren't abundant. Patterson (knee) is inactive for Sunday's game against the Jets. Analysis: With the versatile Patterson out Sunday, the Patriots' Week 17 wideout corps will be headed by Julian Edelman, Chris Hogan and Phillip Dorsett. Patterson (knee) is listed as questionable for Sunday's game against the Jets. Analysis: Patterson was forced out of the Patriots' Week 16 win over the Bills, but it looks like he has a good shot to play Sunday after practicing all week, albeit in a limited fashion. Assuming he suits up this weekend, the versatile Patterson could carve out some deep-league fantasy utility, given that he offers occasional contributions in the ground game and could draw more passing targets going forward with Josh Gordon (suspension) no longer in the picture. Patterson (knee) was limited at practice Wednesday. Analysis: Patterson departed the Week 16 victory over the Bills with a knee injury, but his limited participation Wednesday is encouraging with regard to his status for Sunday's game against the Jets. His versatility has been an asset to the Patriots this season and if he suits up in Week 17, he could carve out some deep-league utility. Patterson offers occasional contributions in the run game and has the potential to draw more passing targets with Josh Gordon (suspension) no longer in the mix. Patterson (knee) practiced Wednesday, Zack Cox of NESN.com reports. Analysis: The versatile Patterson left the Patriots' Week 16 win over the Bills with a knee injury, but his presence at practice suggests he's not in much danger of sitting out the regular-season finale against the Jets. It's welcome news for the Patriots, who can't really afford to lose more depth at receiver with Josh Gordon (suspension) out of the picture. Patterson was forced out of Sunday's game against the Bills with a knee injury. Analysis: Prior to his exit, the versatile Patterson carried four times for 66 yards and caught one of his two targets for three yards. His injury is yet another hit to a New England receiving corps that is now without Josh Gordon (suspension). Julian Edelman, Chris Hogan and Phillip Dorsett are currently the team's top healthy wideouts. Patterson (illness) was removed from the Patriots' Week 16 injury report after returning to practice Friday. Analysis: Patterson logged just five snaps in the Week 15 loss to the Steelers, but he should see more work Sunday against the Bills with Josh Gordon (suspension) no longer available. The same applies to both Chris Hogan and Phillip Dorsett, with the team likely to fill the passing-game void created by Gordon's absence with a committee approach. Patterson (illness) returned to practice Friday, Doug Kyed of NESN.com reports. Analysis: Patterson missed Thursday's practice due to an illness, but now that he's back on the field, he'll likely head into Sunday's game against the Bills minus an injury designation. After logging just five offensive snaps in Week 15, Patterson should see more involvement this weekend with the suspended Josh Gordon no longer in the picture for New England. Patterson missed practice Thursday due to an illness. Analysis: We'd expect Patterson to recover in time for Sunday's game against the Bills, at which time he should see an uptick in snaps, given that Josh Gordon is no longer in the Patriots' wideout mix. The same applies to both Chris Hogan and Phillip Dorsett, who will vie with Patterson for the team's Week 16 wide receiver targets that don't go to Julian Edelman. Patterson (undisclosed) was not spotted at practice Thursday, Zack Cox of NESN.com reports. Analysis: We'll have to see if he's dealing with an injury or illness, but with Josh Gordon (pesonal) having stepped away from the team, the Patriots' depth at wideout would be taxed if Patterson's Week 16 status comes into any question. Julian Edelman, Chris Hogan and Phillip Dorsett were the top wideouts the Patriots fielded at Thursday's practice. Patterson caught all three of his targets for 20 yards in Sunday's 17-10 loss to the Steelers. 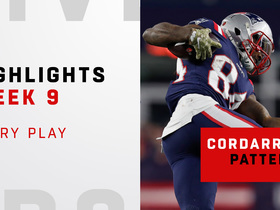 Analysis: Patterson did not record a carry for the second straight week, and his backfield involvement figures to be minimal going forward, with the return to health of both Sony Michel and Rex Burkhead. Patterson's versatility and ability as a returner are assets to the Patriots, but his fantasy upside is hampered by a lack of reliable volume. Patterson logged 18 of a possible 82 snaps on offense in Sunday's 34-33 loss to the Dolphins. Analysis: In the process, Patterson caught two of his three targets for 51 yards, including a 37-yard TD strike. The versatile wideout/returner is capable of making explosive plays, but volume is an issue for him in a passing offense that also feeds receivers Julian Edelman and Josh Gordon, as well as tight end Rob Gronkowski and running back James White. Patterson was on the field for eight out of a possible 74 snaps on offense in Sunday's 24-10 win over the Vikings, en route to catching both of his targets for 53 yards and rushing once for six yards. Analysis: The Patriots managed to get Patterson some chances to make plays Sunday despite limited snaps, but the return to action of running back Rex Burkhead gives the versatile playmaker one more teammate to compete with for complementary touches in the Patriots offense. Patterson is a hit-or-miss fantasy option in that context. Patterson played 22 of the Patriots' 70 offensive snaps in Sunday's 27-13 win over the Jets and finished with one reception for minus-one yard and five carries for 10 yards. Analysis: Patterson's versatility and skills as a return man are useful to the Patriots, but his run of fantasy relevance seems to have come to a screeching halt following Sony Michel's return from injury in Week 11. The 27-year-old has earned a combined 10 touches the past two weeks and could see that number plunge further if the Patriots bring Rex Burkhead (concussion) back from injured reserve ahead of their Week 13 matchup with the Vikings. Patterson was on the field for 12 of the Patriots' 66 snaps on offense in Sunday's 34-10 loss to the Titans. Analysis: The versatile wideout's profile in the Patriots offense was predictably reduced Week 10 due to the return to action of running back Sony Michel (knee). Patterson did end up with four carries for 11 yards Sunday, but as long as Michel is healthy enough to head the New England backfield, Patterson will be largely off the fantasy radar in his complementary WR/RB role. With Sony Michel (knee) back in action, Patterson is in line to resume his normal reserve wideout/return duties Sunday against the Titans. Analysis: The versatile wideout helped fill in for Michel out of the New England backfield over the last couple of weeks, but as long as Michel avoids any in-game setbacks, Patterson's workload will dip in Week 10. Patterson remains dangerous in the return game and capable of breaking off the occasional big play when the coaching staff finds ways to get the ball into his hands, but he's a fantasy roll of the dice in his standard role, which he'll return to Sunday. Patterson (neck) does not carry a Week 10 injury designation in advance of Sunday's game against the Titans. Patterson (neck) was listed as limited at Wednesday's walk-through practice, Mike Reiss of ESPN.com reports. Patterson carried the ball 11 times for 61 yards and a touchdown in Sunday's 31-17 win over the Packers. He added seven yards on his lone reception. Analysis: Sony Michel (knee) wasn't able to suit up, allowing Patterson to receive double-digit carries for the second consecutive week. The former wide receiver has adapted well to his new role, averaging 4.7 yards per carry over the last two games without coughing up a fumble. If Michel is unable to go against the Titans on Sunday, expect Patterson to fill his between-the-tackles role while James White handles the bulk of receiving duties out of the backfield. Analysis: With Sony Michel (knee) inactive, Patterson is a candidate to see added snaps out of the Patriots' backfield Sunday night, while James White handles his high volume change-of-pace/pass-catching duties and Kenjon Barner is on hand in reserve. Patterson surprisingly led New England in carries (10 for 38 yards) in the team's Week 8 win over the Bills, so he's an option for those with the flexibility to plug him into a flex spot in place of either Michel or tight end Rob Gronkowski (back/ankle). Patterson is listed as questionable for Sunday's game against the Packers after being added to the Patriots' injury report Friday with a neck issue. Patterson rushed 10 times for 38 yards and was not targeted in Monday night's 25-6 win over the Bills. Analysis: Patterson surprisingly led New England in carries in the wake of top running back Sony Michel (knee) being sidelined. While the wideout was able to rip off a run of 22 yards, his other totes didn't yield much territory. Additionally, he didn't feature in the passing game, where James White again saw double-digit looks out of the backfield. Depending on Michel's status going forward, it'll be interesting to see if the elusive Patterson continues to line up as a runner or returns to receiver. Patterson was on the field for six of a possible 64 snaps on offense in Sunday's 38-31 win over the Bears. Analysis: Though his only touch on offense was a four-yard run, Patterson -- who lost a fumble Sunday -- did make his mark as a returner, taking four kickoffs for 179 yards, including a 95-yard TD. Julian Edelman, Chris Hogan and Josh Gordon remain entrenched atop the Patriots' wideout depth chart, which limits Patterson to occasional TDs that are tough for fantasy players to count on occurring on a weekly basis. Patterson was on the field for six of a possible 78 snaps on offense in Sunday's 43-40 win over the Chiefs. Analysis: In the process, Patterson carried once for three yards and hauled in his only target for 13 yards. With Julian Edelman, Chris Hogan and now Josh Gordon entrenched atop the Patriots' wideout depth chart, Patterson's involvement in the offense figures to be sporadic. He's still capable of breaking off the occasional big play, but his most consistent impact going forward figures to come in the return game. Patterson was on the field for eight of the Patriots' 69 offensive snaps in Thursday's 38-24 win over the Colts, finishing with two receptions for 11 yards and a touchdown on two targets. 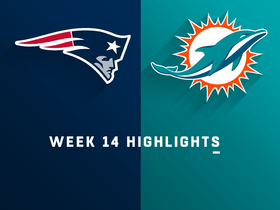 Patterson caught three of his five targets for 54 yards and a touchdown in Sunday's 38-7 win over the Dolphins. He also ran once for 11 yards. Analysis: The 27-year-old wideout was on the field for 41 of the team's 81 snaps on offense Sunday, but the looming return of Julian Edelman from a four-game suspension figures to cut into Patterson's opportunities to steadily contribute in the offense moving forward. He should, however, continue to see kick return work and remains capable of breaking off the occasional big play when the Patriots find creative ways to get the ball into Patterson's hands. Patterson hauled in his only target for 12 yards in Sunday's 26-10 loss to the Lions. Analysis: While working as the Patriots' No. 3 wideout Sunday, Patterson logged 19 of a possible 48 snaps on offense. Through three games, Patterson has caught five of his seven targets for 36 yards, and his modest involvement in the team's attack figures to wane in the coming weeks, with Josh Gordon (hamstring) having been acquired in a trade last week and Julian Edelman due back from his suspension Week 5. Patterson hauled in three of his five targets for 18 yards in Sunday's 31-20 loss to the Jaguars. Analysis: Patterson, who also ran once for five yards in the game, was on the field for 27 of the Patriots' 61 snaps on offense Sunday. He's in line to continue to serve as the team's No. 3 wideout for the next two weeks, with Julian Edelman not eligible to return from his suspension until Week 5. Patterson logged 16 out of a possible 75 snaps on offense in Sunday's 27-20 win over the Texans. Analysis: In the process, Patterson ran three times for 13 yards and caught his only target for six yards. He was predictably out-snapped by both Chris Hogan (68) and Phillip Dorsett (57), but it does appear as though the Patriots will look for ways to get the ball into his hands in the coming weeks. That could result in some occasional big plays for Patterson, who also sees kick return work, but he's not a reliable fantasy lineup option so long as he slots in as the team's No. 3 wideout. With Julian Edelman set to serve a four-game suspension to start the season and the Patriots having released Jordan Matthews, Malcolm Mitchell and Kenny Britt, Patterson has a chance to be a factor in the Patriots' passing game early on, ESPN's Mike Reiss reports. Patterson caught five of nine targets for 37 yards in Friday's 25-14 loss to the Panthers in the third preseason game. 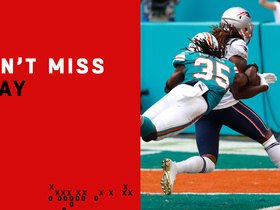 Analysis: Patterson hauled in one of his two targets from Tom Brady, gaining 10 yards before adding to his total with backup quarterback Brian Hoyer in the second half. New England's target leader on the night, the elusive Patterson is vying for playing time while Julian Edelman is suspended the first four games of the regular season. Patterson caught four of his seven targets for 51 yards and a TD in Thursday's 37-20 preseason win over the Eagles. Analysis: Patterson is expected to make his mark as a kick returner for the Patriots this year, but with Julian Edelman set to serve a four-game suspension to start the regular season, there will be a target void to fill out of the gate. Chris Hogan is locked in as a starting wideout for the team, but Patterson, Phillip Dorsett, Eric Decker and Kenny Britt (hamstring) -- when healthy -- are all candidates to see added opportunities in Edelman's absence. Patterson (undisclosed) was limited at practice Monday, the Mark Daniels of the Providence Journal reports. Patterson has made some impressive plays in practice this summer, ESPN's Mike Reiss reports. ESPN's Mike Reiss views Patterson as a roster lock "because of his value as a kickoff returner and gunner." Analysis: At 6-foot-2 and 220 pounds, Patterson adds size to the Patriots' wideout corps, but how much of a role he ends up carving out in the offense has yet to be determined. The 2013 first-rounder is off the fantasy radar for now, but beyond the fact that Julian Edelman and Chris Hogan top the team's depth chart, not much is set. Patterson will thus contend for slotting with the likes of Jordan Matthews, Malcolm Mitchell (knee), Phillip Dorsett, Kenny Britt and Braxton Berrios. Patterson said head coach Bill Belichick informed him that the Patriots informed him they believe they get can the most out of his potential, Zack Cox of NESN.com reports. The Raiders traded Patterson and a 2018 sixth-round pick to the Patriots on Sunday in exchange for a 2018 fifth-round pick, Mark Daniels of The Providence Journal reports. Analysis: Patterson led the league in kick-return average in 2017 among qualifying players, reeling off 28.3 yards per return. He recorded only 31 catches for 309 yards, however, suggesting that the Patriots' acquisition of Patterson is largely meant to be a special-teams boost. Further reinforcing this suggestion is the fact that the Patriots' main kick returner in 2017, Dion Lewis, recently departed to the Titans. Patterson wrapped up his 2017 campaign with 31 catches (on 42 targets) for 309 yards to go along with 13 carries for 121 yards and two touchdowns in 16 games. Patterson (hip) does not carry an injury designation for Sunday's game against the Chargers after practicing fully Friday. Analysis: With fellow wideout Amari Cooper (ankle) back in the mix, Patterson's path to targets is muddled heading into Week 17, making him a fantasy dart in the Raiders' season finale. Patterson (hip) was a limited practice participant Wednesday, Michael Gehlken of the Las Vegas Review-Journal reports. Analysis: Patterson landed on last week's injury report with the same hip injury and ended up catching one of two targets for seven yards in Monday's 19-10 loss to the Eagles. His decreased role seemingly was a result of Amari Cooper's return to the lineup, rather than his own hip injury. Patterson caught one pass on two targets for seven yards in Monday's 19-10 loss to the Eagles. Analysis: Patterson, who had averaged nearly 34 offensive snaps per game in the Raiders' previous five contests, logged just 13 snaps in Week 16 with the rest of the team's receiving corps back at full strength. His opportunities could be limited once again in Week 17 during the regular-season finale against an impressive Chargers pass defense. Patterson (hip) was not assigned an injury designation for Monday's game against the Eagles after being listed as a full practice participant Saturday. Analysis: It looks like there's a pretty solid chance that fellow wideout Amari Cooper (ankle) will return to action in Week 16, which could limit Patterson's opportunities in the Oakland offense Monday. Alternatively, if Cooper ends up being a surprise scratch in advance of the contest, Patterson could serve as a decent last-minute replacement. Patterson (hip) was limited at Thursday's practice, Vic Tafur of The Athletic reports. Analysis: Patterson and the Raiders don't play until Monday night, so his practice regimen over the next couple of days will give a better picture of his game status. He's currently leading the league in yards per kick return with 28.3, so Oakland's special teams would take a hit if he were to sit against the Eagles. Patterson caught one pass on two targets for seven yards during Sunday's 20-17 loss to the Cowboys. He also lost four yards on his lone rushing attempt of the contest. Analysis: Patterson logged his most offensive snaps (45) since Week 8 with Amari Cooper (ankle) sidelined in Week 15, but he failed to translate the opportunity into fantasy production. The lone bright spot for Patterson came on a 44-yard kickoff return, though he also fumbled out of bounds twice during the contest. Patterson could be in line for additional targets in Week 16 against the Eagles if Cooper is held out, but fellow receivers Michael Crabtree and Seth Roberts would limit his upside. Patterson could take on increased offensive snaps in Sunday's game against the Cowboys with Amari Cooper (ankle) ruled out for the contest, Paul Gutierrez of ESPN.com reports. Patterson caught three passes on six targets for eight yards in Sunday's 26-15 loss to the Chiefs. Analysis: Patterson tied his season-high in targets with six during Sunday's loss, but he averaged a dismal 2.7 yards per catch and has yet to record a single receiving touchdown in 13 games. He's now logged at least 25 offensive snaps in four consecutive games and there could be a solid chance that streak extends into Week 15 after starting receiver Amari Cooper re-injured his left ankle on Sunday. Patterson (hip) is listed as active for Sunday's game against the Chiefs. Analysis: Meanwhile, Michael Crabtree is back from a one-game suspension and Amari Cooper (ankle) is listed as active as well, so while Patterson could still factor in some on Sunday, his path to targets is less clear than it was last weekend, when both Cooper and Crabtree were unavailable. Patterson (hip), who is listed as questionable for Sunday's game against the Chiefs, is considered likely to play, Ian Rapoport of NFL Network reports. Patterson (hip) is listed as questionable for Sunday's game against the Chiefs. Patterson (hip) returned to a limited practice Thursday. Analysis: Patterson's Week 14 fantasy upside continues to be tied to the status of fellow wideout Amari Cooper, who missed practice both Wednesday and Thursday with an ankle issue. If Cooper is ruled out for Sunday's game against the Chiefs, Patterson would merit a look in deeper fantasy formats, though Michael Crabtree is back from his suspension and would be in line to head Oakland's Week 14 wideout corps if Cooper remains sidelined this weekend. Patterson (hip) didn't practice Wednesday. Analysis: Patterson has been managing a hip issue of late, so it's quite possible that his absence Wednesday is maintenance-related as opposed to being indicative of a setback. In any case, Patterson's Week 14 fantasy upside hinges on the status of fellow wideout Amari Cooper, who is trying to move past both a concussion (which is no longer a concern) and an ankle sprain. Patterson caught all four passes directed his way for 97 yards and rushed twice for one more yard in Sunday's 24-17 win over the Giants. Analysis: Handed a starting role with Michael Crabtree (suspension) and Amari Cooper (concussion/ankle) both absent, Patterson took advantage with his biggest receiving day of the season. While the Tennessee product still has not caught a touchdown on the year, he has set a season-high in receiving yards in each of his last three contests. He may have an opportunity to stretch that streak to four if Cooper cannot recover in time to take on Kansas City in would be an enticing Week 14 matchup. Patterson (hip) is listed as active for Sunday's game against the Giants. Analysis: With Michael Crabtree (suspension) and Amari Cooper (concussion/ankle) out, Patterson figures to be in store for an increased role in the Raiders' passing attack in Week 13. Also in the mix for added looks with the team's top two wideouts sidelined are Seth Roberts and Johnny Holton. Meanwhile, tight end Jared Cook's profile in the team's offense could also expand Sunday. Patterson (hip) is listed as questionable for Sunday's game against the Giants. Patterson (hip) was listed as a limited practice participant Wednesday. Analysis: It's an issue that Patterson played through in Week 12 and with Michael Crabtree (suspension) out this week and Amari Cooper (concussion/ankle) iffy, we'd expect Patterson to be available Sunday against the Giants, likely in store for an increased role in the Raiders passing offense. Patterson (hip) got regular first-team work at Wednesday's practice in the absence of Michael Crabtree (suspension) and Amari Cooper (concussion/ankle), Michael Gehlken of the Las Vegas Review-Journal reports. Patterson caught three of four pass attempts for 72 yards in Sunday's 21-14 win over the Broncos. Analysis: Patterson only saw one target in the first half, but connected all three times he was thrown to in the second, after Tim Crabtree (ejection) and Amari Cooper (concussion) were forced from the game. The 26-year-old's 54-yard catch late in the fourth quarter gave the Raiders the first down they needed to put the game away. If either Crabtree or Cooper were unable to play in Week 13, Patterson would stand to benefit again versus the Giants. Patterson (hip) is listed as active for Sunday's game against the Broncos. Analysis: Patterson remains behind Amari Cooper and Michael Crabtree in the Raiders' wideout pecking order, so he's only an option in deeper formats. His 45-yard output in Week 11's loss to the Patriots represented his season high, and overall, Patterson has logged just 18 catches for 114 yards through 10 games to date. Patterson (hip), who is listed as questionable for Sunday's game against the Broncos, is expected to play in the contest barring any complications in pregame warmups, a source informed Ian Rapoport of NFL Network. Analysis: Patterson was added to the Raiders' Week 12 injury report after tweaking his hip during Thursday's practice, which resulted in him sitting out Friday's practice. The Raiders seem to believe that two days off for rest will be all Patterson needs to get over the injury, so look for him to reprise his usual role as the team's kickoff returner while seeing a handful snaps on offense in three- or four-wideout sets. Patterson (hip) is listed as questionable for Sunday's contest against the Broncos. Analysis: Patterson's usage has swung wildly on a weekly basis as a Raider. As evidence, he earned 87.7 percent of the offensive snaps in Week 8 when Seth Roberts was sidelined, but just 9.4 of those same snaps when Roberts returned one game later. With his practice reps decreasing from full Wednesday to none Friday, Patterson appears to be a true question mark in advance of Sunday's 4:25 p.m. EDT kickoff. Patterson (hip) was limited at practice Thursday. Analysis: Patterson remains behind Amari Cooper and Michael Crabtree in the Raiders' wideout pecking order, but he could push Seth Roberts for a share of the No. 3 role down the stretch, assuming his addition to the injury report Thursday is the result of a minor ailment. Patterson caught four passes on as many targets for 45 yards during Sunday's loss to the Patriots. Analysis: After logging just six offensive snaps against Miami prior to the Raiders' bye week, Patterson took advantage of his increased snap count in Week 11 as he hauled in all four of his targets. Seth Roberts, who has filled the No. 3 receiver role all season, struggled with drops and lost a fumble in the red zone, which could potentially result in additional opportunities for Patterson in the slot against the Broncos in Week 12. 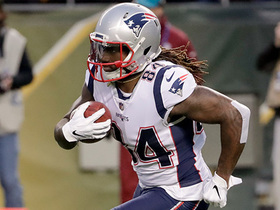 New England Patriots wide receiver Cordarrelle Patterson shows off his speed as he races down the sideline for 27 yards. 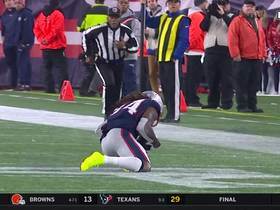 New England Patriots quarterback Tom Brady throws an absolute dime to wide receiver Cordarrelle Patterson for a 37-yard touchdown. New England Patriots wide receiver Cordarrelle Patterson pulls in a fingertip catch for 29 yards on a pass from his quarterback Tom Brady. 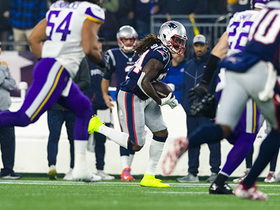 New England Patriots wide receiver Cordarrelle Patterson speeds down the sideline for 24 yards on a pass from his quarterback Tom Brady. 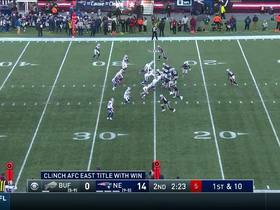 New England Patriots wide receiver Cordarrelle Patterson checks in at RB, powers for fourth-down conversion. 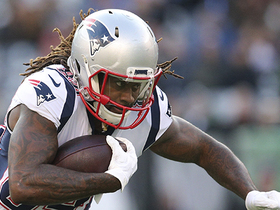 NFL Network's Akbar Gbaja-Biamila explains why New England Patriots wide receiver Cordarrelle Patterson is his top waiver wire target. 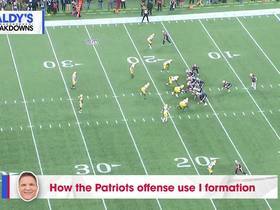 NFL Network's Brian Baldinger takes an inside look at how the New England Patriots use the I formation in their offense with New England wide receiver Cordarrelle Patterson as a running back against the Green Bay Packers in their Week 9 matchup. 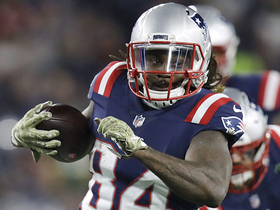 Watch every way the New England Patriots used wide receiver Cordarrelle Patterson in his Week 9 matchup against the Green Bay Packers.